Crush 2 sticks of rhubarb (in a plastic bag with a rolling pin or a pestle and morter) and put into a Kilner type jar (must be at least a litre and half) with 3 tablespoon of sugar and leave for 2 days. Add 3 cloves, 1 cinnamon stick (or 1/2 teaspoon), zest of ½ a lemon and cover with 1 Litre Vodka. Filter through muslin (of coffee filter) and leave for 3 months – if you can! This can be done with other fruit than rhubarb. Try, for example, raspberry or blueberry. Makes a nice present when bottled into small kilner bottles. Sounds great, will try this as soom as possible. Can you eat the rhubard as well? Can’t see any reason why not!!!!!!!!!! Looks great and am going to make it now. 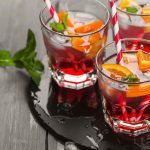 Any recipes for more vodka fruit mixes, I have got some fruit bushes and trees growing and this sounds a great present idea. Will try this with my huge rhubarb, maybe double up on quantity though, so it lasts till xmas. Any fruit will happily preserve / flavour any clear vodka-type spirit i.e. schnapps (if you have a source) will work just as well. You can also do it with brandy, but brandy has more of a flavour of its own, so is a bit trickier. Take a jar, drop a layer of soft fruit in, or of sliced hard /skin fruit e.g. apples or peaches. 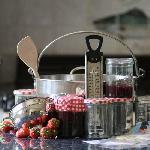 Sprinkle over a tsp of sugar, flat towards heaped, depending on how sweet you think you like your home-made liqueurs. If you can, use brewing sugar, rather than granulated, because it leaves less of a sugar flavour i.e. it imparts sweeteness with rather less taste. Repeat until the jar is nearly full of fruit. Then fill the jar with your chosen spirit. Put the lid on, & invert a few times. In other words, shake, but gently. Do that on a daily basis until the sugar’s dissolved. Leave it for as long as possible for the flavour to develop. If you’re fussy, you can strain it before drinking or, if you’ve made enough, you could strain it off into more presentable bottles. Any fruits that are edible raw, you can certainly re-use in some fashion. 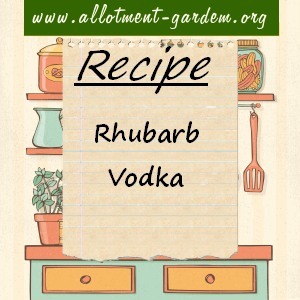 I’m not so sure about something like rhubarb, and cooking it would promptly cook out most of the alcohol. Finally, although I’ve never tried it (yet! ), there’s no reason why you shouldn’t substitute a tsp of honey for each tsp of sugar. Will be using some of my rhubarb for this flavoured vodka. I made what I call fruit vodka last year , I made 3 different flavours.